Early music news, performances and recordings. I’m delighted that early American music continues to enjoy popularity. Definitive recordings by the Boston Camerata and Anonymous 4 put the music on the map and Rose of Sharon, a spectacular 2011 recording by Joel Frederiksen and Ensemble Phoenix Munich, honors it as true American art music. There have also been high-minded and brilliantly performed crossover records like Appalachian Waltz (with the dream team of Yo-Yo Ma, Mark O’Connor and Edgar Meyer), which stressed folk and bluegrass-rooted Americana. Both approaches are valid and welcome. 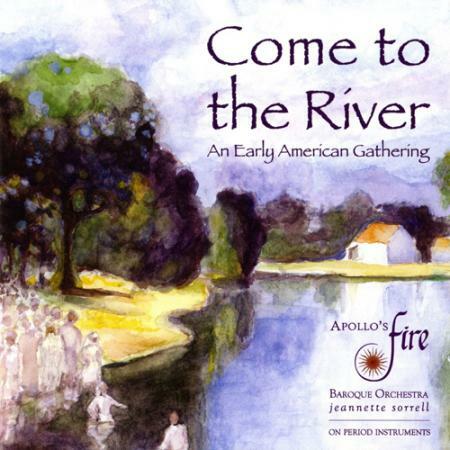 Come to the River by Apollo’s Fire, a period instrument ensemble, weighs in with a decidedly crossover album that will delight fans of that genre and probably put off listeners who are more purist. The album features a number of New England and Appalachian tunes, Southern spirituals and other traditional tunes in arrangements by Sorrell, ensemble member Paul Shipper and even one by Custer LaRue (a member of the Baltimore Consort, a group who scored big hits with just this kind of crossover). The Apollo’s Fire vocalists all possess polished voices and the instrumentalists perform well. But the spontaneous loose improvisatory style that’s the album’s chief selling point just come across as stiff and corny. I’ve no problem with creative arrangements of old tunes, but ensemble director Jeannette Sorrell’s take on “Nobody But the Baby,” speaks more of the Manhattan Transfer than anything remotely folksy. This is fun, unbuttoned music but the bluesy growls in “Hold on” sound contrived, and the animal sounds in “Willie, Prithee Goe to Bed” are just embarrassing. When the tone is elevated in a set of Southern spirituals the arrangements don’t work for me. Listen to the studied prettiness of Apollo’s Fire’s “Wondrous Love” and compare it with versions sung by Anonymous 4 (on Gloryland) or Lydia Brotherton and Ensemble Phoenix Munich (on Rose of Sharon).